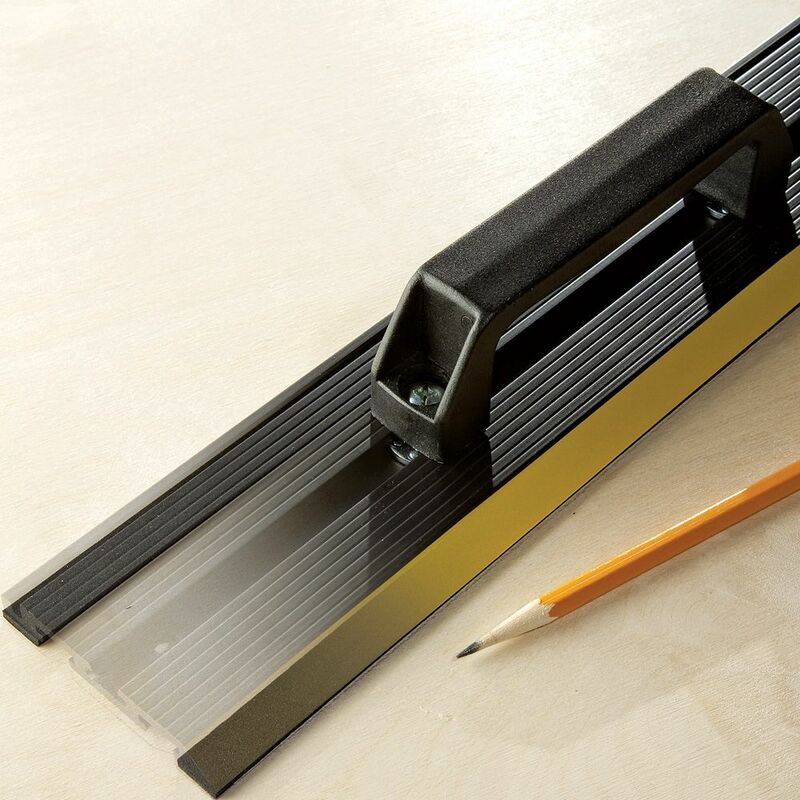 Get arrow-straight cuts with this lightweight straight-edge system. 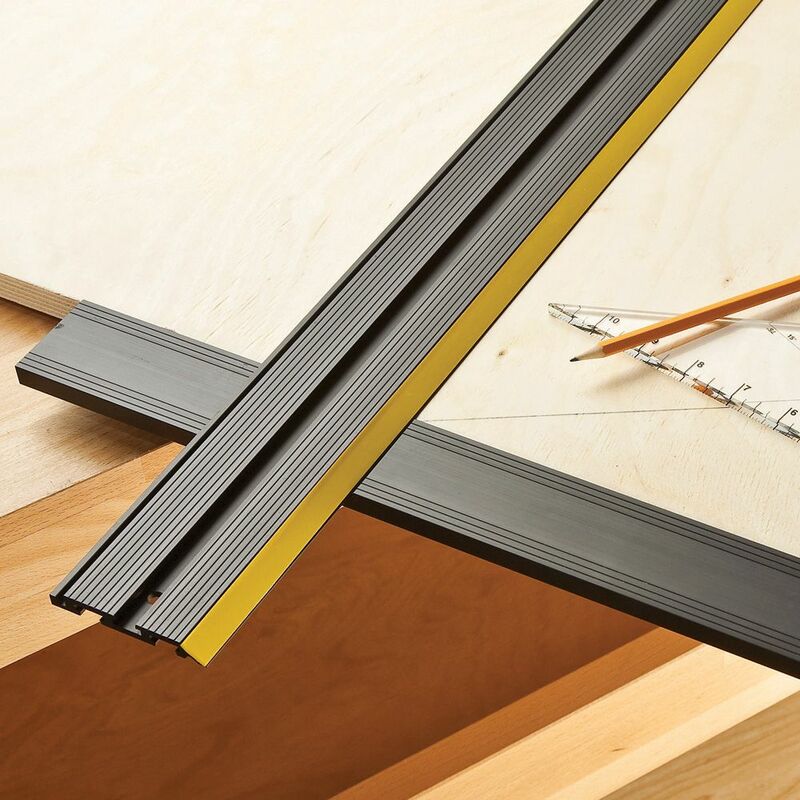 The clamps slide along an integral T-track to accommodate nearly any size of material. 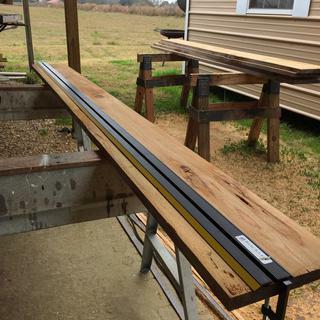 Ripping panels up to 104" long has never been easier! The 52" to 104" Low Profile Straight Edge Clamp does it all. This worked just as fine as table saw . 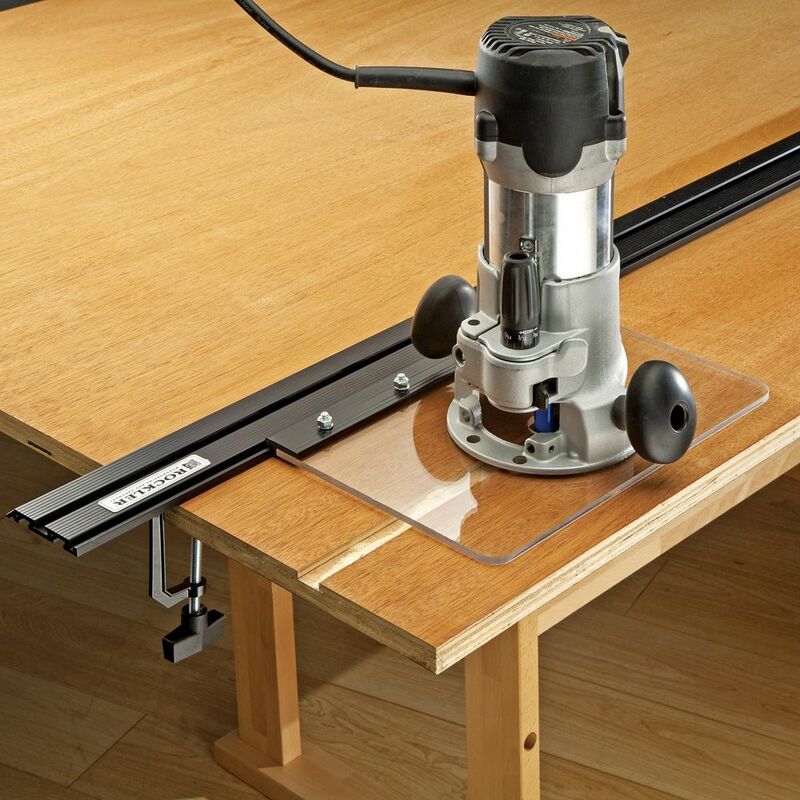 The Rockler Guide system is very robust, simple to use and will get you cutting straight quickly! Great Idea for long cuts. I bought this to use with my router. 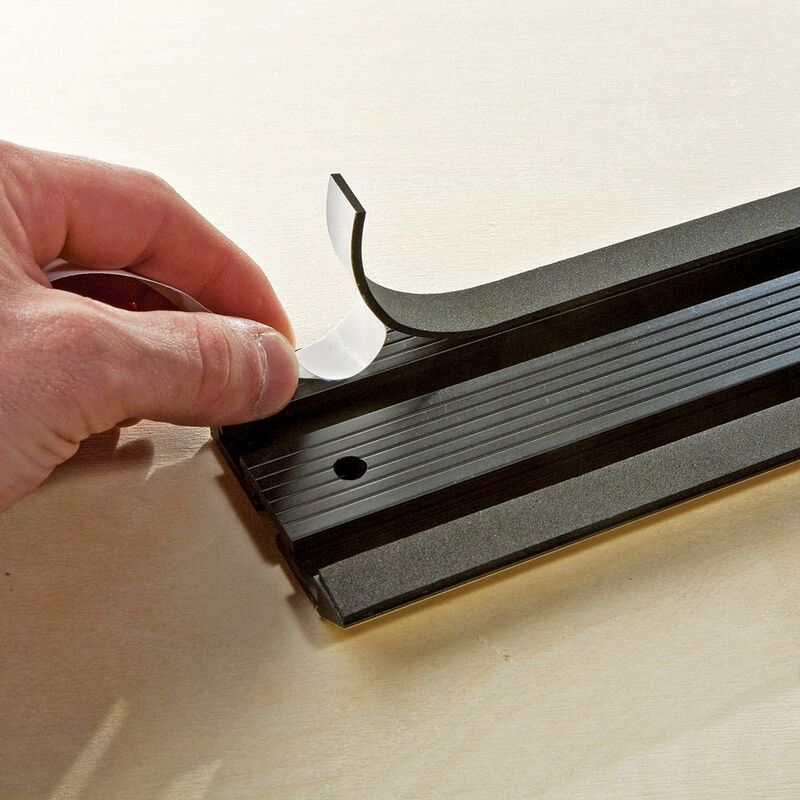 Along with the power tool guide and acrylic base, this system is a great way to ensure straight groves. Easy to use and I can easily see where to start and stop a cut. Had seen, and worked with a similar straight edge while working on a volunteer cabin project. Asked the owner of tool where I could purchase similar straight edge. Hence my Rockler straight edge system! Very happy with straight edge, really like the built in clamps, with handle on top of tool. So convenient. Like the speed in changing lengths. All in all very well thought out tool! Very Sturdy. My old one was very unstable. I like the way the clamps fit in the grooves. 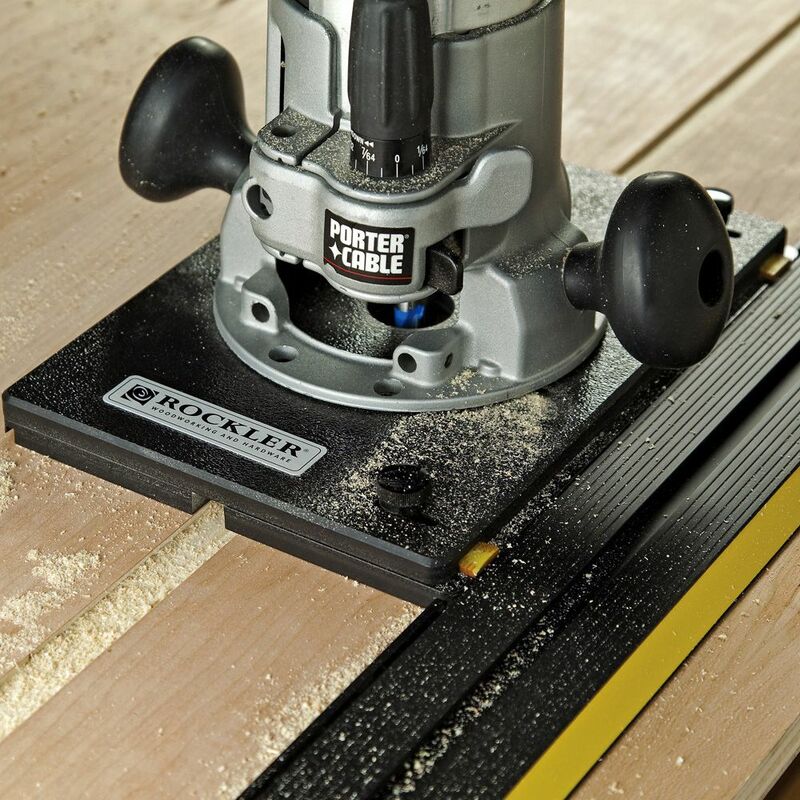 I used this extensively while building a yard playhouse for my grandaughter, It was nice to not have to use my table saw for large sheets of plywood. I can make the cuts alone. I haven't used it yet, but I am very happy with the quality of it. Well made and very sturdy. Unbelievable product for the cost. The quality and precision of this product is outstanding. The ease of assembly and application to work piece makes it great for ripping those awkward 4 x 8 sheets of plywood..
For the price it's a must have! My wife bought the Straight Edge Clamp System for my birthday. We talked about getting a table saw, but decided we didn't have the space in the garage nor the extra money for a really nice one. The staff at Rockler exceeded customer services expectations. They listened to our needs and helped us find a solution that would work best. The System essentially achieved exactly what the table saw would have achieved! Bonus is that it was less expensive, hardly takes up any space in the garage and my wife and I were thrilled with the results. The System will also be a forever necessity in our tool inventory. 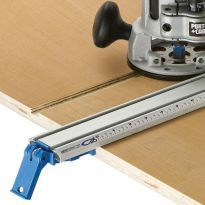 We are pleased with this product and Rockler - definitely recommend both and will continue our patronage in the future. This straight edge is one of the most perfect tools I've ever seen. I put a couple more holes in it to attach it to to crooked planks to facilitate straightening but aside from that, It's just great. Absolutely love this!! I build farm tables and use a lot of not so straight lumber. This makes my job so much easier and faster!! Very pleased with the straight edge. Have used both the single edge and also both linked together. Happy with the results of both cuts. Will be making a sled for my saw to see how that works. So far pleased. Worked great making a straight edge on a piece of cypress. Nice addition to my work shop. Bought this to make some large (tall and wide) garage cabinets after using various plywood jigs for years. WONDERFUL. Easy to use, good clamping, very solid. Wish I'd gotten this years ago. This guide is heavily built. I've only used it a short time but it has delivered quality cuts thus far. One aspect that I would have liked to have seen engineered into the clamps though, would be that they have slightly longer screws so that the clamps could then clamp, and remain stationary, on the underside of the straight edge guide for transport purposes. The screws are just short of making contact with the guide requiring me to place a slat of wood between the clamp foot and the guide to obtain contact. Not a big deal but would have been convenient. I like the handle included. I will obtain another for the second half of the guide. Very universal straight edge. Love the clamps that fit in the track. Makes using as a cutting guide a snap. Would definitely recommend. Really like this system. Like it for the straight edge but the feature of sliding tool system using my router works fantastic for extremely precise edges highly recommend! This piece of metal is what it should be - straight. One could as well buy a piece of any straight metal to accomplish the same task. And save money. This straight edge clamp system is just what I need for breaking down 4x8 sheets that are cumbersome to do on my table saw. I use additional clear mounting plates for each of my tools, and with a razor knife I've etched reference lines for the blade kerf and the different router bits, then filled the lines with dark crayon so I have clear reference lines that are easy to see and line up. I have several clear mounting plates. I've even mounted dust collection hose holders to keep the sawdust in check for nice accurate clean cuts. 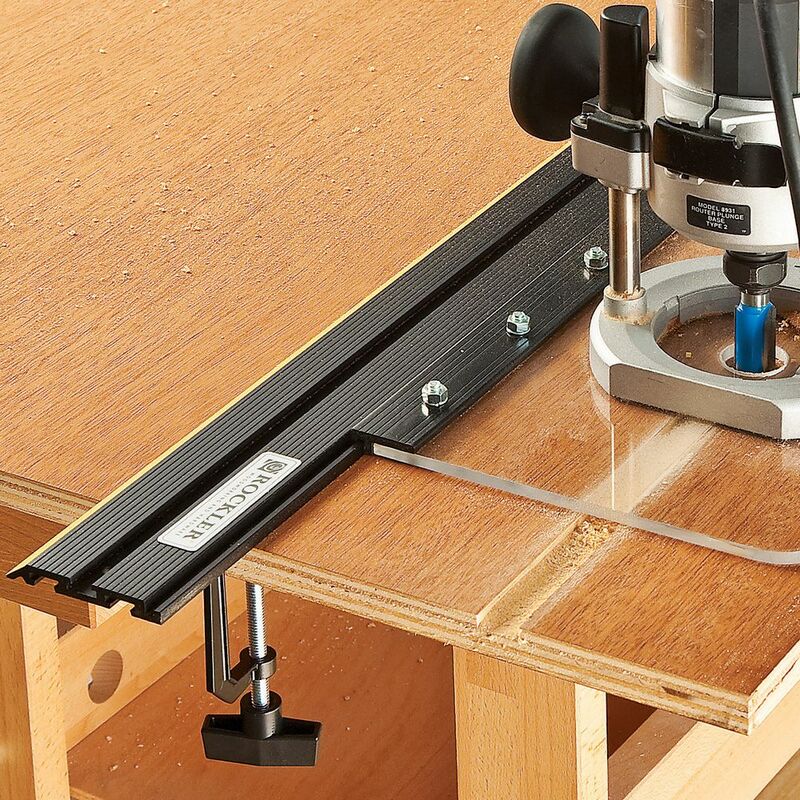 I've already built a very nice T-track table using the straight edge clamp for the T-track dados and plan to use this tool for many projects. I just used this to rip a pile of plywood into 12" strips, and I absolutely loved it. Didn't use the accessory guide kit - I just added 5" to the measurement to compensate for the width of my circular saw base plate. The clamps DO ride a tiny bit when being tightened, but once I realized this it was easy to compensate. It made an otherwise tedious and time-consuming task easy. Great product. My only complaint is that the clamps aren't faster to use and they can make the edge wander a little bit while tightening. Purchased while I was trasforming my garage into a Man Cave / Woodworkers Ultimate Workshop. Just looked at the shipper, that was 4 months ago. I spent time cutting, shaping, drilling the acrylic base to fit my DeWALT DC390 Circular Saw yesterday. Today was the first time I used this system. It is one of those V8 moments: &quot;Dang, wish I had this a long time ago&quot;. I will only use this system to cut large sheets, window frames or doors, so the 6 1/2 blade will do the job and I did not want to mess with cords. I went with the DC390 because it is super easy to remove the motor from base so I could drill/tap so I could mount the acrylic sheet. On the inside I had to remove a lot of tap to get to the parts, Rockler did a great job of shipping this to me, they didn't take any chances. Everything inside the box was taped down and secured. This is a great product for ripping full sheets of plywood. It is very sturdy and lets me finally make accurate cuts with my circular saw. Using a precision square that is accurate to 0.0028&quot; per inch, I was able to attach the T-square and get squared up in just a few seconds, using the t-bolts. Using it to layout and cut some sheetrock for a wall repair took only a few seconds and allowed me to get the job done in less than 2 hours. You can tell by the construction and accuracy of the setup this is a very well made tool. 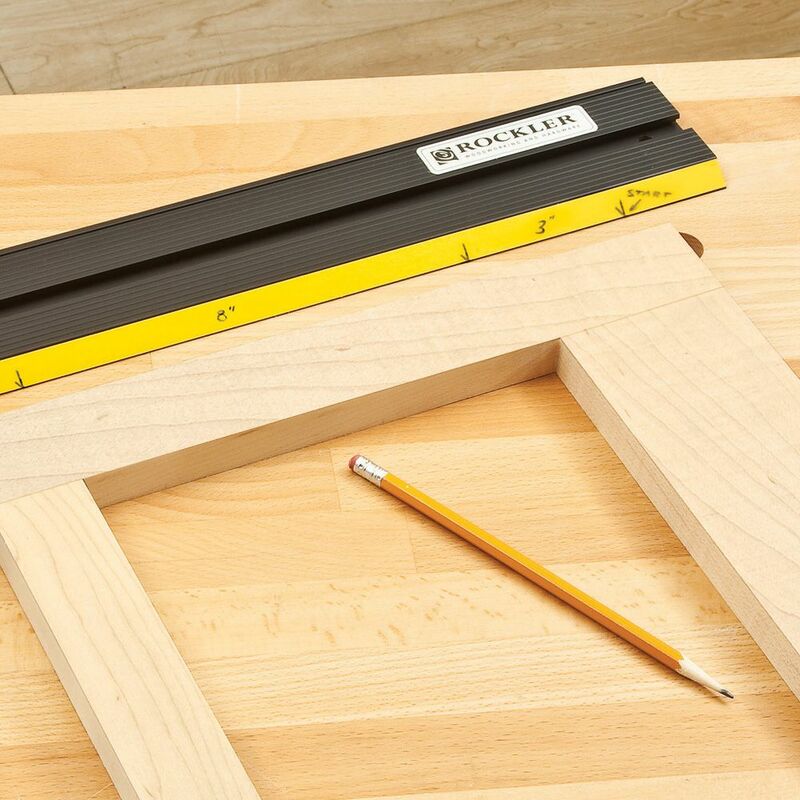 As usual, Rockler has produced another great, accurate tool for woodworking. Keep up the Great work Rockler! Works well and easily. Can tend to bow in the middle causing saw to slide under and off line. More than likely it wasn't tightened properly. Haven't been able to use the "track guide" portion of it yet. I had trouble with the alignment of the two guides to start with, but realized I had over tightened the joining screws.I re- torqued them and got an amazing finish on the next cut. I was using a Freud 71/4 40 tooth blade. It is a worthy investment, and recommend it to anyone who needs to make finish cuts with a portable saw. I use a lot of plywood in my projects. Best tool ever! Makes cutting paneling the best way ever!?????? Great to ! Only problem was one of the clamps, the handle came loose and I had to use pliers to loosen it even with heavy cloth wrapped around it to get it loose! Other than that I have never cut such a straight thin line!! I will recommend this great tool to everyone! Steel and Aluminum don't mix. he store, a store associated inserted the bolts straight and true. The straight edge clamp system is a very useful aid overall. The clamps are troublesome because the bonding material that holds the plastic handle to the threaded metal part of the clamp may break, as mine did. Vice grips saved the day. I liked the product. It worked well for it's intended use. The only problem that I had was both clamp screw handles came loose right-a-way. A little super glue on each cured the problem. I have been using this product for over a year and I love it. I also used the router attachment and am very pleased with that also. The only thing that could be a little better is the clamps. They are a little weak. That is why I didn't give it 5 stars. Had no trouble using it or set was very easy. 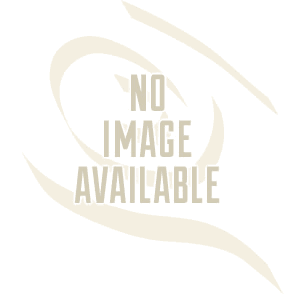 I have just had a chance to use it a couple times an it has worked very well. I did find making the base the saw rides on was a bit of work. 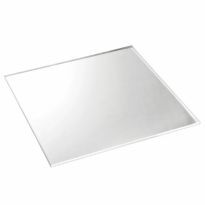 I used the plexiglass blank offered by this company. I would recommend using a drill press since a steady drill bit will minimize the chance of breaking the plexiglass. I wish the holes used to mount the plate to the rail carrier were predrilled. Great tool! Only issue was making sure the 2 pieces were aligned straight for a 8' ripe. The slide in clamps make use a breeze. 1 person with 4 saw horses can make perfect cuts on a 4' X 8' sheet. I have a lot of experience building furniture and cabinets from plywood sheets and cutting up the plywood has always been one of my least favorite tasks. I use to just take a long straight edge and clamp it to the plywood and hope that the saw didn't drift away from the edge before it was too late. 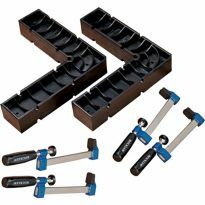 When I saw the Rockler Straight Edge Clamp System I though that the price was attractive enough to give it a try. I also bought the acrylic base plate and T-Track hold down clamps because I read other reviews that cautioned that the clamps that come with the straight edge are kind of wimpy and don't hold well. I suppose I could have used regular C clamps but I liked the top of the track to be free of clamps that could tangle a power cord. I also bought an inexpensive (and light!) circular saw, along with a 7" carbide fine-tooth plywood blade and mounted it to the acrylic plate. BTW, the reason I didn't give this 5 stars is the necessity of having to drill and tap and cut the acrylic plate. A better mounting system would have been nice. The system seems to work well. to make a long cut you fasten the two 52" segments together. I was concerned about this because it is hard to get them into good alignment to form and hold a long straight edge, but I had no problem here. The saw and plate rides easily in the groove with minimal side-to-side movements. Cuts were consistent. I also made a spacer board that allows me to set the straightedge properly so my cut is where I want it. So far, I've cut two sheets of bamboo plywood with four more to go and the system works as promised. For the price, I would recommend it. Purchased this recently and am rating it Very Good. 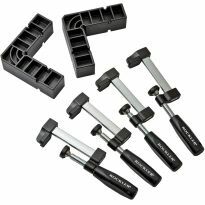 Not sure why other reviews mention it needs additional guides, as these are available from Rockler for a good price. 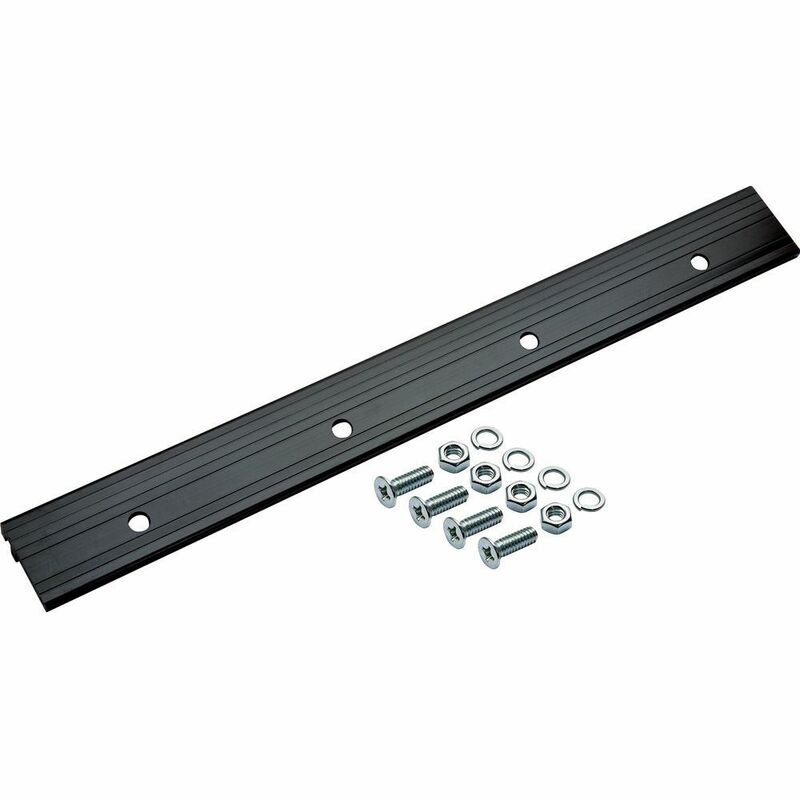 42279 12' x 12' Acrylic Base for Straight Edge System, 42173 Power Tool Guide Kit with Mounting Hardware For Straight Edge System, and 43492 Straight Edge Grip Tape. &nbsp;Comments relating the the T square are valid, but I would never rely fully on any square over a distance of greater than 24 inches....just way too much chance for errors. This product does the job nicely but would be better if the clamps could be tightened from above or below. It was purchased for working in limited spaces and there is inevitably something too close to allow access on one end or the other. The only problem I had with this product is the clamps. They are very whimpy and I had both of them bend and throw the tool out of aligment. I ended up causing damage to two sheets of plywood. When I added two of my own bar clamps this took care of the problem. I am going to try two pair of 36767 clamps and see if I can eliminate the problem of having to use additional clamps. Ordered straight edge system on a Friday and received the item by the next Wednesday. On Saturday I was cutting cutting 4 x 8 plywood panels far more easily and accurately than ever before! I attached the system guide adapter directly to my circular saw base and can now rip a panel perfectly. Only request would be to acquire additional guide adapters so I could have other tool adapters made up and ready to go. Rockler comes through again! Nice tool, with some caveats. Packaging could have been better -- the precise straightedge was marred in two places where something sharp had hit the edge in shipment or when packaged for shipment; had to file the burrs down to avoid damaging the surface of my laminate. Also, the setscrews for the slides holding the two halves together don't fit precisely, or the holes were not drilled and tapped sufficiently -- two of the setscrews are very hard to tighten, and this is absolutely required when making long cuts. I liked how it clamped on to the plywood I was cutting ,but after tightening a few times the handle just kept spinning and I had to use a channel to loosen. overall the staight edge worked for what I had to do. One of the great things about this guide rail is its length but its near impossible to get the two pieces to be inline with one another. All of the accessories work well and are easy to use. 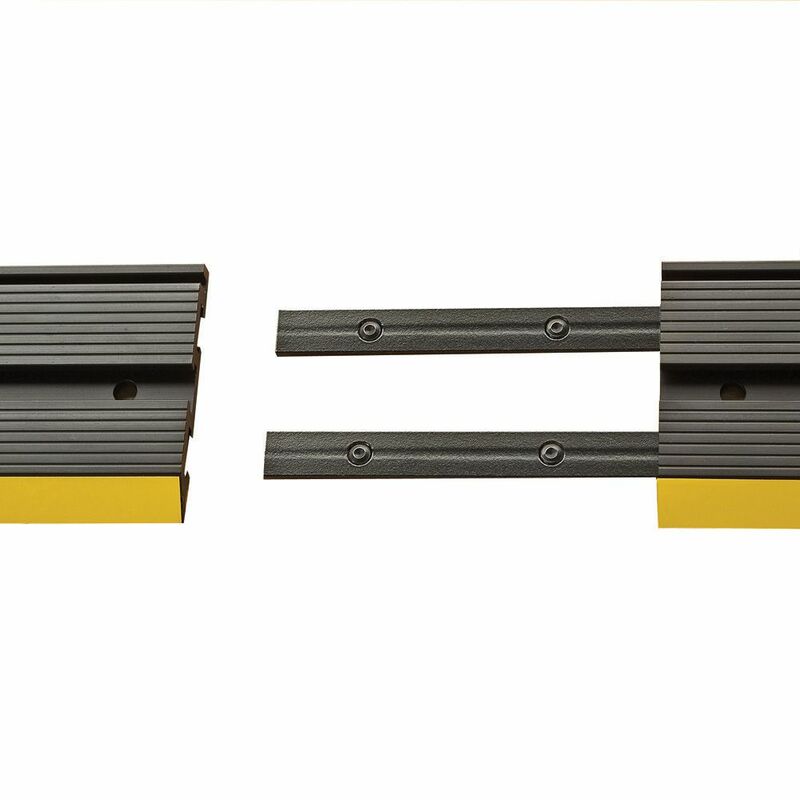 The long edges are great- long enough for many jobs, the alignment edge fits snugly and is perfectly perpendicular. The connections for the long edges are too short and therefore make it difficult to get a good straight long edge. Half of the tiny screws were messed up and unusable. The clamps broke at the first use. They are simply badly designed. It’s a plastic knob on a metal screw held together with some glue. Simply cheap and not thought through. Clamps are cheap and fall apart. The pieces used to hold the sections together are not made to tolerance allowing for too much play and therefore anything but straight cuts, the main reason I bought it. It does have a low profile and individual PCs are straight. Just don’t plan to use for longer than 50” cuts. 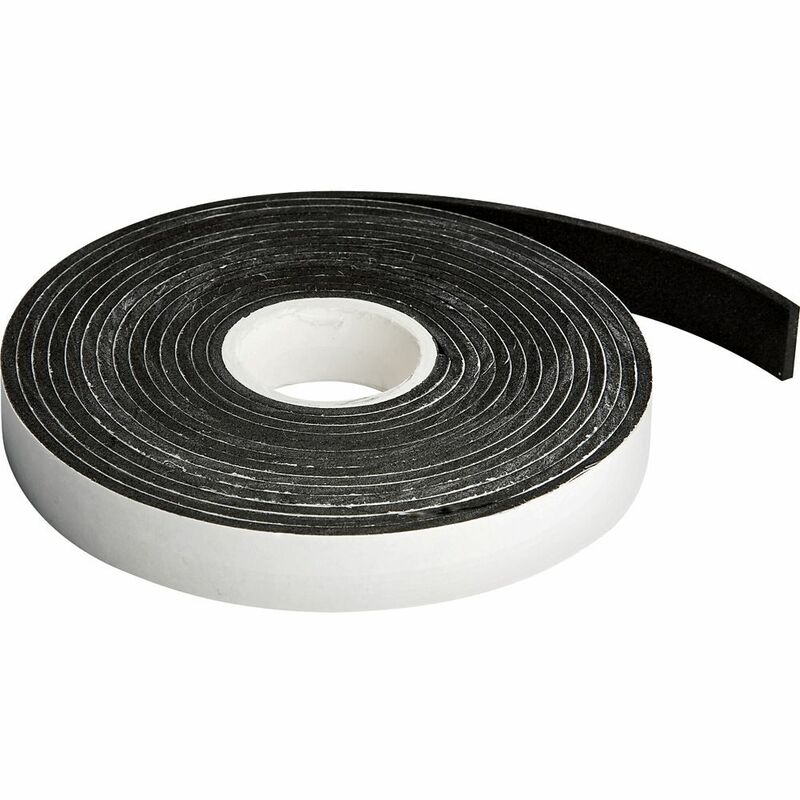 I bought this product to make breaking down a sheet of plywood quicker and easier. My experience was that my circular saw tended to ride up onto the unit or deviate slightly from the edge line no matter what I did to prevent this. I guess spending the the extra money for the sled accessory would have helped, but this would have made the unit quite expensive. I have since built my own jig for plywood cutting. It works great and only cost about a 1/4 sheet of MDF. It looks like something I could have really used in the past and will need in the near future. Looking forward to using this system in ripping the 4x8 sheets of paneling as well as using it for those straight line router cuts. Mine is bent out of shape! needed, lost mine in flood. Need reliable, exact straight edge for router and circ saw. Specifically requested as a Christmas gift by my son. To upgrade my current one so I can give my old one to my son. Have one. Great. This one is a gift. In my modest shop, it is difficult for me to handle 4 x 8 sheet goods on my table saw by myself. Always trying to improve my cuts. This has proven to be a great straight edge system, sturdy and accurate. Novice woodworker here trying to cut/rip in straight lines. These should help out greatly. Planning to make a lot of book cases for all my books. It, straight edge clamp system, is something that I need to make accurate and professional cuts. Should have gotten one years ago. Now i don’t have to be embarrassed by my wavy cuts! Good price for a tool that will quite handy in the shop. inexpensive way to have a panel saw! Anticipating that it will help me. Used as a jig to make straight cuts in plywood and usb sheets as long as 10'. This thing is great for cutting straight lines on a budget. The clamps stay out of the way, so you don't have to worry about extending you're straight edge for cutting with a certain or saw. 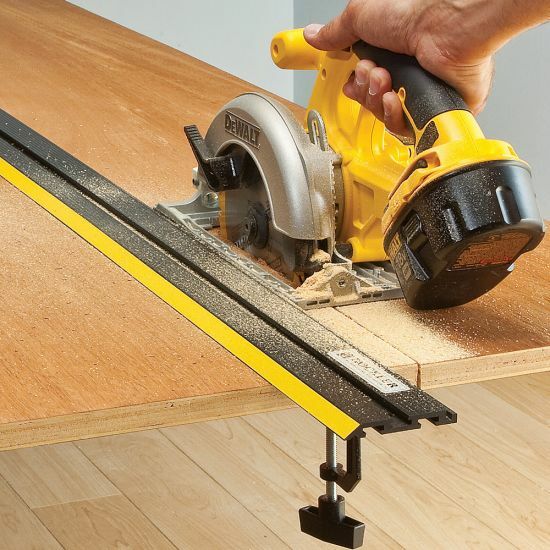 To cut and route straight lines in plywood panels. My son saw a friend using this and wanted one. Good item. Can make straight cuts on plywood without a table saw. I need a guide do use on a 84" plywood. Nice length to this item and durable. 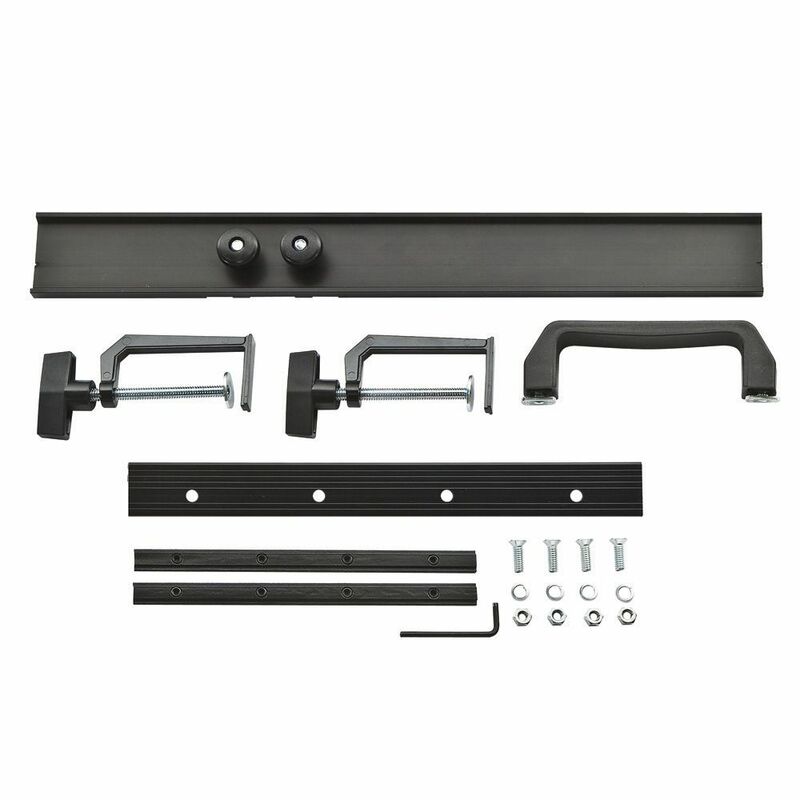 Does this work with the Rockler Perfect Fit Dado Jig (#59443)? Can I use this for smaller cuts then 52"? BEST ANSWER: Absolutely! 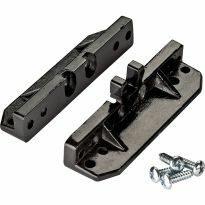 The screw-locks (holding the straight edge to the project) can easily slide to the length you need. Yes, works great with any length. The clamp slides the length of the underside. Can I use this guide to cut papert posts (a littel angled)? For the router attachment is there a correct or perfered side (direction) for using the router attachment? BEST ANSWER: There is only one side that accepts the attachment.